I had the devil of a time researching this recipe, mainly because Steph’s grandmother’s cookbook called them “Fiyuelos”, but after extensive Google search, I ended up finding them by misspelling it! After that I found tons and tons of information. Their original name is “Frixuelos” and they originated from the Spanish provinces of Asturias and Leon in the northern part of Spain. The basic recipe can be prepared on the sweet side, by filling them with whipped cream or egg custard. According to my research the authentic frixuelos are filled with apple compote, and served as a dessert. You can also prepare salty frixuelos by adding scrambled eggs, melted cheese or a meat option. Steph’s mom liked them stacked, sprinkled with sugar and butter – not a bad combo if you ask me. Any way you decide to serve them, they are easy to prepare, and you’re practically guaranteed not to have leftovers. Place butter in a small bowl and heat in microwave until melted. To melt on stovetop, put butter in a small saucepan and heat over low heat, being careful not to burn the butter. Sift together flour, sugar and salt into a large mixing bowl and set aside. In another mixing bowl, beat the eggs, milk and melted butter until well blended. Add milk-egg mixture to dry ingredients and beat until batter is smooth. Heat a non-stick frying pan over medium heat. Melt a very small amount of butter in the pan. Using a ladle, pour batter into pan and cook over medium heat until lightly browned on bottom. Turn over and lightly brown other side. When cooked, transfer to a warm plate. Sprinkle with sugar. Continue to do this until have you cooked all the batter. Fill with your choice of apple compote (a la original) fruit preserves, cream, or egg custard. To create citrus-flavored frixuelos, add grated peel of a lemon or an orange, and a bit more sugar. 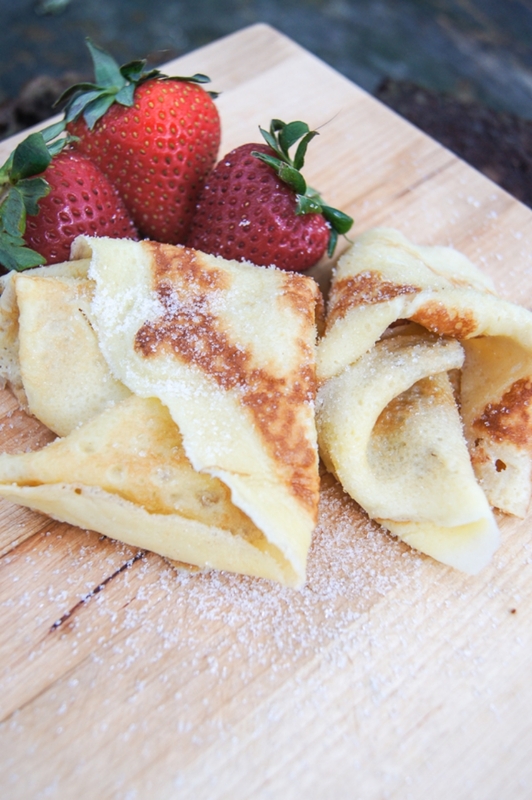 If you have never made crepes, I highly suggest you take a peek a the gazillion YouTube options for you to get the feel of how to fill the hot pan and move the batter around to cover the whole pan. 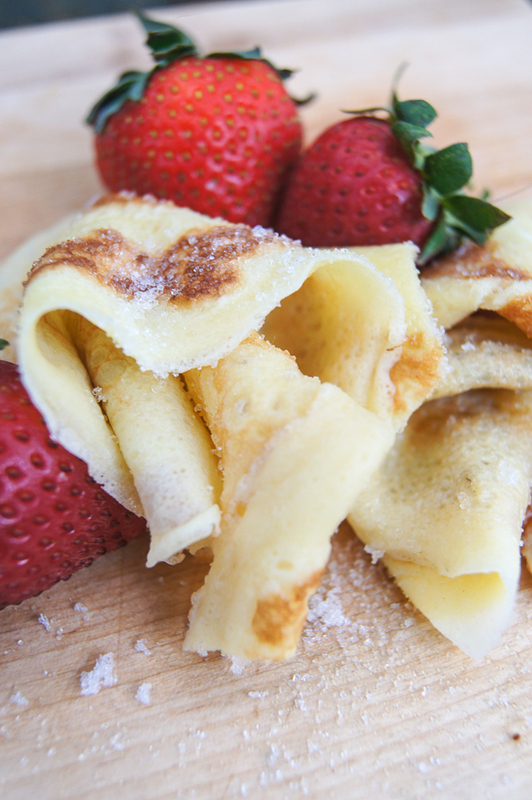 Remember that the key to making good crepes is using a very hot pan. Be prepared to maybe loose your first one and adjust the temperature. While I have giving you step by step above – I have done this 3 times already and the second and third time I have basically dumped mixed all the ingredients together in my 8 cup measuring cup and used my immersion blender to whip everything up at once. As always take a quick peek at our Gutsy Cook Pinterest Board to see what the other home chef did with this weeks choosen recipe.